Edward Clark was arraigned in Somerville District Court on Friday. 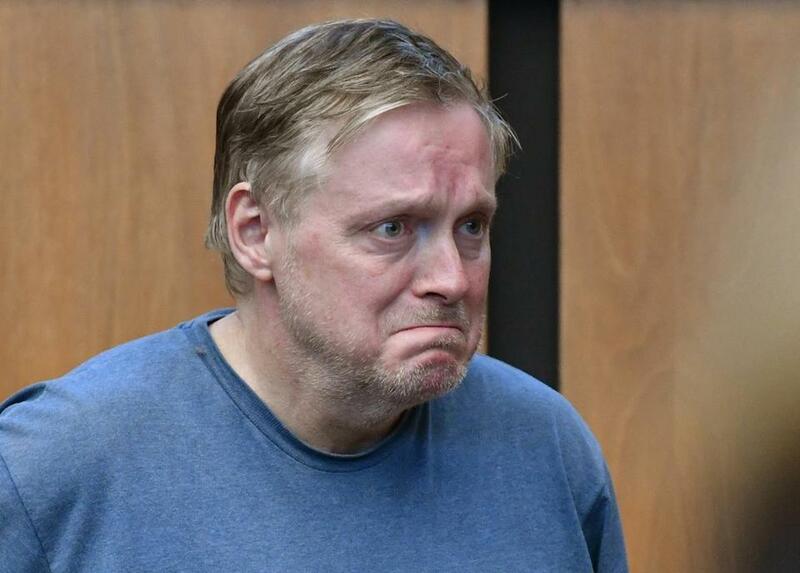 SOMERVILLE — After Edward Clark allegedly struck and killed 40-year-old Allison Donovan with his truck on a busy street here last week, he didn’t stop, authorities said. Instead, prosecutors asserted Friday, he kept driving to his girlfriend’s Medford residence, and the couple enjoyed a dinner out as rescuers tried in vain to save the life of Donovan, a veteran educator and former school principal. Then when police initially confronted Clark, 55, on Thursday, he lied about his whereabouts at the time of the crash, bought alcohol, and tried to destroy evidence before finally admitting to investigators that he “believed he struck a person and was too afraid to stop at the scene,” according to an incident report filed in Somerville District Court. Clark, of Norwood, was arraigned in the court Friday on a charge of leaving the scene of an accident causing death. Prosecutors say more charges are likely as the probe continues. Clark wore a T-shirt and jeans and stood hunched over with his eyes cast downward, as a not-guilty plea was entered on his behalf. Donovan’s relatives sat in the front row during the arraignment and silently watched the proceedings. Her brother, Mark Donovan, told a WBZ reporter that his family wanted to thank Somerville and Tufts police for their work on the case. Allison Donovan lived near the crash site. A veteran educator, she worked for Watertown Public Schools as a K-8 literacy and Title 1 coordinator. She was formerly the principal at the Lincoln Elementary School in Melrose. Her funeral was held on Thursday. Allison Donovan was remembered Friday in a vigil at the crash site. 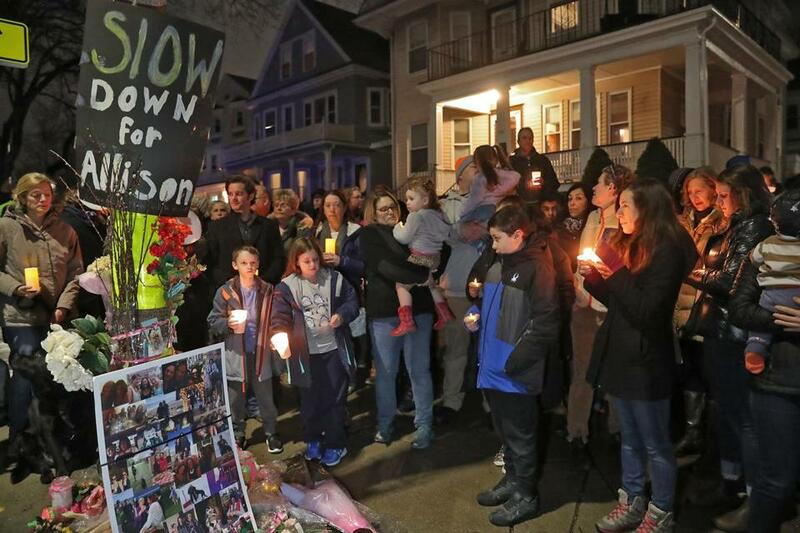 On Friday evening, a candlelight vigil for Donovan drew about 40 to 50 people, many with their children and dogs, who gathered at the scene of the crash at Powder House Boulevard and Hardan Road. “She touched the lives of everyone around her,” said Honor Petrie, one of Donovan’s former elementary school students, her eyes tearing up. Others in attendance said the crash shows the need for safer streets. “It’s such a danger with the congestion,” the Rev. Richard Curran of the Somerville Catholic Collaborative, said of Powder House Boulevard. The Somerville police report said Donovan and another woman suffered serious injuries when they were struck by Clark’s F-150 truck around 7:15 p.m. on Feb. 8 as they tried to cross Powder House Boulevard. Donovan was later pronounced dead at Mount Auburn Hospital, and her friend survived. Middlesex District Attorney Marian T. Ryan said Thursday that the preliminary investigation suggests the two women were in a crosswalk when they were struck. Cops got a break Thursday, when Tufts police alerted Somerville authorities that a black F-150 parked in front of 7 University Ave. matched the description of the offending vehicle, including front end damage and writing on the doors, the report said. When Somerville police first approached Clark, his demeanor aroused suspicion. Meanwhile, the report said, police kept eyes on Clark and observed him engaging in suspicious behavior. “During the surveillance Clark was observed leaving his work station, visiting an insurance company, purchasing an alcoholic drink at a convenience store, and then going to a mechanic shop in Malden,” the filing said. That’s when cops moved in. Then during an interview with detectives, the report said, Clark incriminated himself after receiving his Miranda warning. “Initially he said he thought it may have been a construction cone, a barrel, parked car, or that he had struck the sidewalk, but later in the interview said that he believed he struck a person and was too afraid to stop at the scene, or come forward after he realized the extent of the damage,” the report said. Clark was released without bail Friday with conditions including that he not drive, refrain from using alcohol or drugs, surrender his passport, and submit to GPS monitoring. His next court date is scheduled for March 15. Clark has eight prior surchargeable accidents on his driving record that occurred between 1986 and 2017, according to a history provided by the RMV. He was also cited for a marked lanes violation in February 1984, speeding in June 1984, and driving without an inspection sticker in March 2013 and July 2014, the document shows. His license is suspended as a result of the fatal crash, records show. 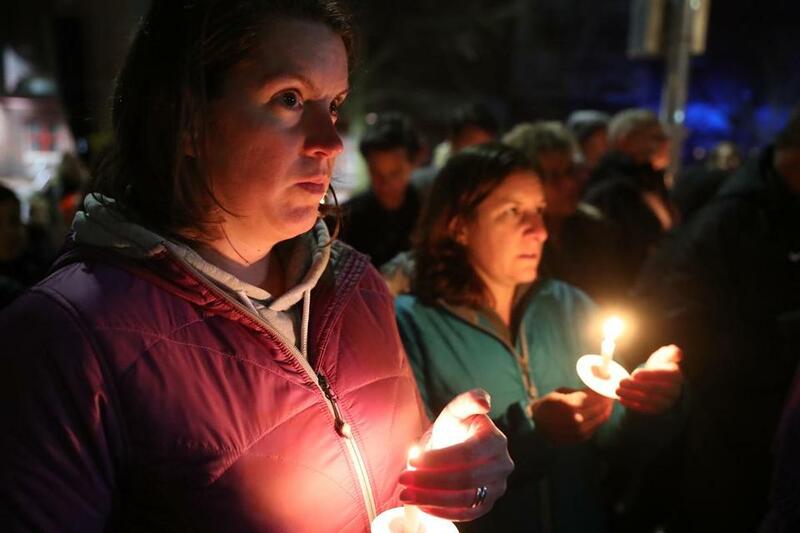 Shani Leichter and Christine Carlettei held candles at Friday’s vigil. Correspondent Andrew Stanton and Danny McDonald of the Globe Staff contributed to this report. Travis Andersen can be reached at travis.andersen@globe.com. Follow him on Twitter @TAGlobe. Emily Sweeney can be reached at emily.sweeney@globe.com. Follow her on Twitter @emilysweeney.